What likely helps Best Buy maintain such steady returns is the nature of its competitive advantage. Unlike companies that have to continually invest to maintain their advantages (e.g. pharmaceuticals, smart-phone makers etc. ), Best Buy gets to profit off of the product innovations of others, by relying on its already-established distribution network. It does face competition from other retailers (both bricks and mortar as well as online), but the risks to its business are easier to see in advance and easier to protect against than say a company hoping to bring a new drug to market or a company trying to hit a home-run with a new technology it hopes consumers will adopt. But despite the steady returns, Best Buy's stock price has been volatile (as we saw when we considered the company last year), allowing investors the ability to buy this company on the cheap. In 2008, the company was available for $18/share, a 60% discount from what it was a few months before. In 2009, the stock ranged from $25 to $45. How does the value of such a steady company change by as much as 100% in a single year? This year appears to be shaping up in a similar way, as the stock has gone as high as $48, but has fallen by more than 25% from those levels. Much of that drop can likely be attributed to a shortfall in the latest quarter's earnings. But besides the fact that the first quarter is a nothing quarter for a retailer like Best Buy (almost 60% of the company's annual profit comes from the Christmas quarter), basing a company's value on any quarter is not a sound way to invest. This is exactly the kind of short-term thinking in which the market participates, however, which allows long-term investors to profit. 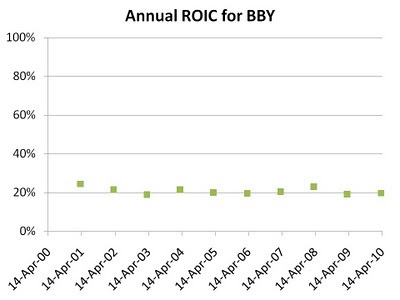 Joel Greenblatt has clearly spelled out for us the benefits of investing in high ROIC stocks when their P/E's are low. Best Buy appears to be once again (for the umpteenth time) creeping into that territory. As the price continues to fall, those who have not yet found their way into this steady performer on one of its previous price plunges may find a great price at which to do so. Shareholders are best served when company resources are utilized to grow a company's earnings power. Or, as Warren Buffett likes to say, "Our managers focus on moat-widening". But when top management is busy spending its time touting the stock price rather than improving the business itself, shareholders are likely not well-served. Consider China Marine Food Group (CMFO), a distributor of seafood products. The company's top management is going on a road show to NYC in the coming weeks. But there is no stock being sold on its road show! Apparently, the company simply wishes to talk up the stock to prospective and current investors. In other words, there's likely no increase in the company's intrinsic value by this use of company resources, only an attempt to pump up the stock price. Perhaps an argument could be made that such actions make sense if management felt that shares were undervalued. That argument appears moot, however; apparently, management does not feel its shares are undervalued, as it recently issued almost $30 million worth of shares for "general corporate purposes" at what was the prevailing market price. The company has no debt, and would still have had $20 million of cash on hand without the offering (to put this amount in perspective, consider that the company's quarterly operating expenses are but $1.6 million). As such, it appears that there was no pressing need for the cash, suggesting that management did not care about dilution and is more interested in empire-building than in increasing each share's value. And an empire-building spree appears to be what's going on, as recently the company spent $28 million for a control stake in a beverage company. Of major concern to shareholders is the fact that only $2 million of hard assets (net their liabilities) were acquired, meaning the company paid $26 million for intangibles! Some was classified as goodwill ($2.5 million) while the rest ($23.5 million) was actually classified as "Algae-based drink know-how"! This acquisition and all its intangibles generated but $1 million of gross profit in the latest quarter, but the company sure has ambitious plans for it. The company issued a release claiming expectations of a 60% year-over-year growth in revenue for this acquisition, and "normalized long-term net profit margins of 25%". To put this in perspective, Coke (KO), which can be described as the most successful beverage company at keeping competitors at bay, generates net profit margins of just over 20%. As such, it's hard to believe that even CMFO management believes its own projections! As a commenter on this site wrote recently, it is better when management focuses on intrinsic value rather than stock price, though the two will converge in the long run. Clearly, CMFO management is focused on the stock price, which is just the sort of situation value investors seek to avoid. It may seem strange to see discussion of a stock like Research In Motion (RIMM) on a value-oriented site. After all, the company would be better classified as a growth stock, as revenues have grown from $3 billion to $6 billion to $11 billion to $15 billion in its last four fiscal years. Furthermore, the smart phone market is expected to continue to grow at double-digit rates going forward, fueling expectations that RIMM's revenue and earnings will continue to increase. But startlingly, RIMM does not trade at a high premium to its earnings. While profits throughout this downturn have continued to ratchet up (RIMM's operating profit grew 38% in its last quarter, year-over-year) RIMM's stock price has continued to fall, currently trading near its 52-week low. With a P/E of just 13, RIMM's price is in value territory. Considering the company has no debt, and almost $3 billion in cash and equivalents, the company's P/E after subtracting cash is just 12. Unlike many other successful tech companies, however, RIMM historically hasn't held onto a large cash balance, instead investing it at a stellar rate (ROE was 36% in its latest fiscal year!) or more recently using some of it to buy back shares (one quarter ago, the company bought back $800 million worth of stock). The likely cause of this apparent discount is the fact that RIMM is going to head-to-head in the smartphone space with what's likely a superior foe, Apple (AAPL) and its iPhone. But RIMM has advantages that it can continue to exploit, such as its preference among corporations, its more efficient use of bandwidth (resulting in higher profitability for its sellers, the carriers, resulting in favourable pricing), and its international growth. In other words, in the growing smartphone market, there's enough room for everyone to keep increasing profits while maintaining above average returns on capital and equity. At this price, investors appear to be offered the opportunity to participate in this growth without having to pay much at all. In this chapter, Dreman takes the reader through the history of technical analysis. Technicians try to determine the future prices of stocks by looking at charts of past prices. They look at items like moving averages and head-and-shoulders patterns to help gauge future prices. They care not if profit explodes or if a plant implodes, as they believe they can determine future prices from past prices only. Many early technicians used astrology to guide their decisions, and some made some correct calls and ended up well-followed. Eventually, however, every famous technician has run into a bad streak. (One such example is the famous Joseph Granville, who made a few correct calls in a row and became so well followed that it is believed he single-handedly moved markets.) Today's technician uses the immense power of computers to help detect the patterns for which they are looking. Technical analysis has survived despite the evidence that suggests its use is of no help. As early as 1900, a French PhD Student (using commodity and bond price/volume data) concluded that past prices could not predict future prices. Since 1960, many academics have come to the same conclusion across a number of different asset classes and markets, with no exception. It is from this work that the idea of the Efficient Market Hypothesis came to be. Dreman concludes by instructing the reader not to use market-timing or technical analysis, as they will only cost you money. Ben Graham was the first to demonstrate that stocks that trade at large discounts to their net current asset values can generate strong returns for shareholders. Since then, many in the field have undertaken their own studies of this phenomenon with similar results. However, while this group of stocks may be expected to outperform the market, not every stock within the group will do so; some companies generate negative returns, thus bringing down the average. Investors, therefore, needn't invest in such stocks indiscriminately. Instead, investors can improve on the returns of the studies by avoiding the stocks with the highest risk. Consider I.D. Systems (IDSY), provider of RFID technology for the management of heavy-duty mobile assets. A couple of months ago, the company was rather attractive from a net current asset perspective, trading at just $35 million versus net current assets of almost $50 million. But several risk factors combined to severely reduce the attractiveness of this investment. First of all, the company has not shown that it can make money. It has not been profitable in any of the last four years, racking up operating losses of $35 million in the process. While shareholders are shouldering these losses, they are also being diluted. The company hands out claims on its shares like candy, with restricted stock and options currently outstanding representing almost 30% of the company's actual shares! Furthermore, the company is heavily reliant on a few customers for its revenues. Customers like Wal-Mart, that make a living from squeezing everyone with whom it does business (except consumers). Management has also shown that it would rather spend the large cash reserve it has rather than return it to shareholders. The company recently partook in a $15 million acquisition that essentially removed the margin of safety on the company's discount to its net current assets. Not all stocks trading at discounts to their net current asset values are bargains. Several troubled companies are on this list, and investors would do well to eliminate those that have great downside risk versus those that show potential for minimal downside risk. When management's interests are aligned with those of shareholders, agency costs are minimized. Management and shareholder interests are most aligned when the chief executive has a large portion of his wealth invested in the business; in this way, the manager is also a shareholder. This incentive alignment leads to actions that are shareholder friendly, which is not the norm in many companies. Jewett-Cameron (JCTCF) is a company we discussed two months ago that not only appears to have a well-aligned incentive structure, but appears to trade at a discount to its intrinsic value. When these two circumstances appear in combination, you are likely to see a share buyback. Indeed that's exactly what happened, as last week the company issued a release that it would re-purchase its shares. 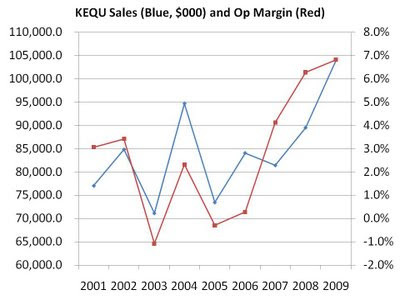 But while share buybacks are rather common, the level of communication (continuing with this theme, as we have recently discussed how management's communication with shareholders can lead to either positive or detrimental results, depending on the extent to which it is done) in this release was a step above what shareholders are accustomed to. First of all, the company stated that it would only purchase shares at prices below $7/share. (The current price is around $6.70.) In almost all cases, shareholders are not given any information of this nature, making it difficult for shareholders to include buybacks as part of their valuation models since the purchase prices paid for shares do not become public until well after the fact. Second, the buyback program covers a period of only 2.5 months. (Most buyback periods are one year long, and even then many are not completed during this time frame.) This sends a strong signal that the buyback will be immediate (subject to the paragraph above) in the company's budget worksheet, removing any fears that this is an attempt to talk the stock up rather than implement real action. Finally, the buyback program covers a massive 18% of Jewett's outstanding shares, whereas most buyback programs cover less (sometimes far less) than 10% of the company's shares. As a result, it can serve to significantly increase the intrinsic value of each share. Last week, however, as the company's first quarter results came in below expectations, the stock once again plunged to a level far below its net current asset value, to lows not seen since November of 2008. But while the company traded for under $100 million following the earnings report, it holds current assets of $194 million ($120 million of which is cash) against liabilities of just $35 million. Often, a company trading at this kind of discount to its current assets is losing money hand over fist. But Acorn expects to pull in net income of over $12 million this year, even after a first quarter result that was below expectations. As the company has now worked through much of its older inventory, it can now focus on selling items with better margins and returns. With so many products to choose from, the company has an inherent advantage (compared to a one-product company, for example) in being able to choose to promote the most successful products, which helps ease the strain on the company's budget planner.